Another way to help get your kids involved in preparedness is to take them shooting. Children can and should be taught about firearms at a young age. How young depends on you and your children. You know your children best and whether they are old enough or mature enough to handle a firearm. All of our children (our youngest is 5) understand gun safety rules and how to behave at a range—not because we’ve talked about it even though we have, but because they’ve been around it. We’ve had BB gun shooting contests in the back yard, taken them with us hunting upland game and deer, and had them shoot at an organized range. Always supervise children with any firearm, and always practice the rules of safe shooting yourself as you are the example they will follow. And I know you wouldn’t do this, but don’t just take your sons shooting. My girls shoot as well as my boy and have just as much fun doing it. Remember your family is your team and you want every member as capable as possible with the skills and tools they will need. As a side note here, some children are not interested in shooting. This could be for a variety of reasons. Don’t rush them, but do continue to invite them and provide opportunities to be around firearms in a safe environment. Looks like a very sucessfull hunting trip. 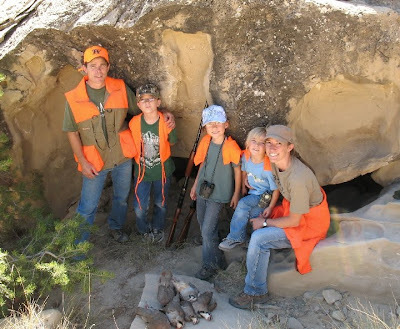 Good job on passing down and teach your kids to hunt, it is becoming a lost art and part of American history. My daughter has always been a better shot than my sons :) And she doesn't let them forget it! The kids were taught young (Safety, handling, etc) – and always had access to the 22 pistol in the barn. (It was hidden so you had to know where it was, to avoid other kids from finding it/using it, and you had to be taller than 5 years old to get to it)…. They also ALL know how to butcher, cut, and wrap an animal. In fact my son called me Sunday saying he had an emergency cut and wrap – cow broke her leg – and could I help wrap so he could get it done faster :) Kids :) Always know that Mom will be there to help if needed.